So I can't help suspecting a few hints were being dropped in this guest post by my other half. And as two can play at that game I have idled away some time this weekend picking out some new season favourites of my own. My bank balance being what it is, they probably won't be coming home with me anytime soon...unless of course, a certain somebody felt like picking me up a wee treat or two on payday. Ahem. How fabulous is the shearling detail on this leather-look handbag from ASOS? I'm not a jeans person but I've been intrigued by these ones ever since they came to The White Door in Dublin; they promise to make you look slimmer and flatter to figure, so what's not to like?! Gorgeous diamond pave evil eye ring in 18 carat yellow gold vermeil on sterling silver, with bezel set turquoise. Love! What are you hankering after this autumn? I am lusting after a nice dark gray sweater and anything burgundy these days. Wanting to cosy up in that gorgeous chunky knit! These items are so lovely for Fall! I absolutely adore that sweater. Love your picks Em - that jumper is fab. Love everything on your list! That jumper in particular-it looks so cosy! i love the colours you've chosen here! The jumper is gorgeous, as is the ring. I've been loving knitwear and ankle boots lately, can't wait to get the woolies out! Cozy knits and boots! I love Fall fashion. All of your picks are great and I would love to own all of them. That Marc Jacobs sweater is such a lovely color! I do miss sweater season! my bank balance is screaming too! hahahaha i love blue and black combinations. i want a leather skirt! The bag is cute! A very comfy selection. Wishes do come true! Oh how I love those boots! Moto boots are totally on my fall must-purchase list, too! Perfect! I'll take those studded boots and the skinny jeans! Gorgeous! I also want the boots and the gold cuff! 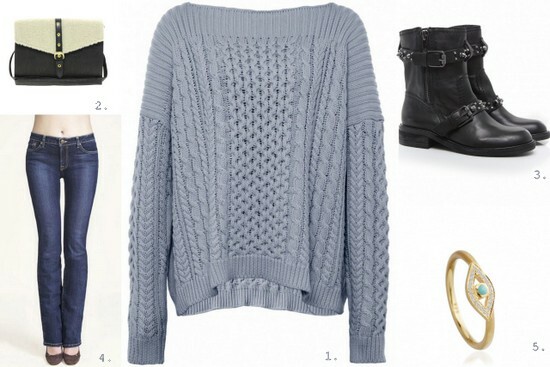 Love the knit and the boots! Hi I just found your blog and I am so glad I did! I just followed your blog and would appreciate if you could do the same back!